This is not a traditional Fudge recipe, because real FUDGE is a non cook mixture of melted chocolate, milk (sweetened condensed) and butter. 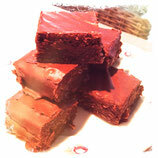 For the origin of Fudge and other true Fudge recipes try some of our other Fudge recipes on the site. However, this recipe came to me through one of my mom’s old friends, and I have been making it since I was about old enough to hold a spoon… and because it is simple and the output is so great, I thought I would include it anyway. So thanks to Guri, who probably doesn’t know that 30 years on, I am keeping up her tradition! ;-). This is more like a sort of Brownie base with a killer icing on the top, but because of its richness it gets cut into smaller squares than Brownies traditionally do… hence the likeness to Fudge. First heat the oven to 350°F. Prepare your baking tin - either greasing it with butter or lining it with grease-proof paper, if it’s a metallic tin. If it’s one of the new silicone ones, you won’t need to grease it at all, it will peel right off the Fudge once cooled. Heat the butter over low heat, then add in the sugar, cocoa powder, eggs, and flour. If you are using walnuts, add the vanilla extract and chopped walnuts, if you are going for the almond version, add in the almond slivers and the almond extract. Mix well until all the ingredients are combined, this reciped doesn’t even call for an electrical whisk or food processor, it’llbe done before you even have time to pull them out.Then pour the batter into your cake tin and cook for 30-35 mins. This is a tricky one, be sure it is done when it comes out of the oven, it should be dry on the edges but a little wobbly in the middle, but not too wet. While the cake layer is cooking, start preparing the icing: heat the sweetened condensed milk on very low heat, then add the melted butter, the powdered sugar, cocoa and vanilla extract. This icing will be a little stiff – which it should be – but if it is really too stiff, add a little milk.You will need to be able to pour it out. Once the cake comes out of the oven, and before it cools down, pour the icing on top. It will melt from the heat and spread around the cake evenly. Just make sure it doesn’t overflow, but you do want to use the heat form the cake as it will allow the icing to settle over the entire cake, and as it cools it will harden again, with a nice smooth finish. Let the cake cool down completely, then you can cut it into small squares (about half the size of a Brownie). These can be served with a coffee, in a little miniature paper cup.I think you’ll find the hardest part though will be to limit yourself to one… M-Joy!